Indie Retro News: Else We Get Mad! - A homebrew beat em up on the Amiga? YES! Else We Get Mad! - A homebrew beat em up on the Amiga? YES! 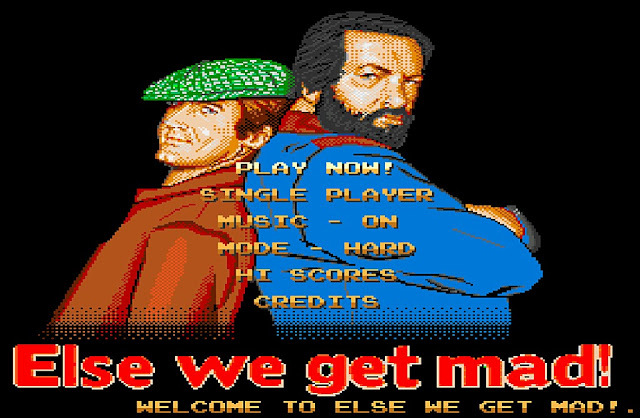 This is a very rare thing for us to mention as news, but AmigaWave has made available a work in progress demo for their homebrew beat em up, 'Else We Get Mad! ', which shockingly is for the Amiga with 512 Kb memory. Yes indeed from the same creators of the medieval adventure game Furtum Sacrum, comes the latest tease for a beat em up that has appeared on the Amiga that isn't an adventure game or platformer, something we see a lot of on this system. Else We Get Mad! Isn't the most graphically impressive game we've seen on the Amiga but for a work in progress title and as a first tease it isn't a bad game so far at all. There's always plenty to do throwing punches and launching high powered kicks at multiple enemies while listening to an upbeat tune, and the controls and game scrolling is smooth throughout. However when it comes to the enemies themselves I would like to see more variation, rather than the bikini male dressers seen throughout.